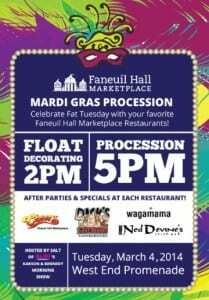 Faneuil Hall Mardi Gras Procession Today! Celebrate Fat Tuesday today, Tuesday, March 4, 2014 at Faneuil Hall with float decorating at 2pm and a Mardi Gras Procession at 5pm. Live Music by Soul City! For more information, please head here. Also, don’t forget you can still receive half-off select food items through the end of the month at local food vendors and restaurants!